READING, Pa. - Bieber has apparently put the brakes on its bus service, at least for the time being. According to a hand-written sign posted on the door of the Inter-City Bus Terminal in downtown Reading, "all bus service is cancelled till further notice," effective 4:30 p.m. Friday. Taxi cabs and Uber cars were parked outside the terminal on North Third Street, awaiting the scheduled 5:30 arrival in Reading of a bus from New York City. Multiple Bieber employees have also told 69 News that they've been having trouble being paid by the Berks County-based company in recent weeks. WFMZ's Irene Snyder reports seeing people inside Bieber's headquarters in Kutztown appearing to be packing up their things. The developments come exactly one week after Bieber celebrated the extension of its permit to drop off and pick up passengers at Eighth Avenue and 39th Street in midtown Manhattan. That permit, issued by New York City, is good until February 2020. Bieber was forced to find a new pickup and drop-off location after being evicted from the Port Authority's bus terminal in Manhattan in July. The Port Authority said Bieber owes it more than $200,000 in fees. As for its bus terminal in Reading, Bieber listed it for sale last year, Bieber put it up for sale last year, with an asking price of $575,000. Calls and emails to Bieber's management have not been returned. A call to the number listed on the sign posted at the bus terminal in Reading was abruptly disconnected. A subsequent call went to voicemail. Nothing on the Bieber website though. 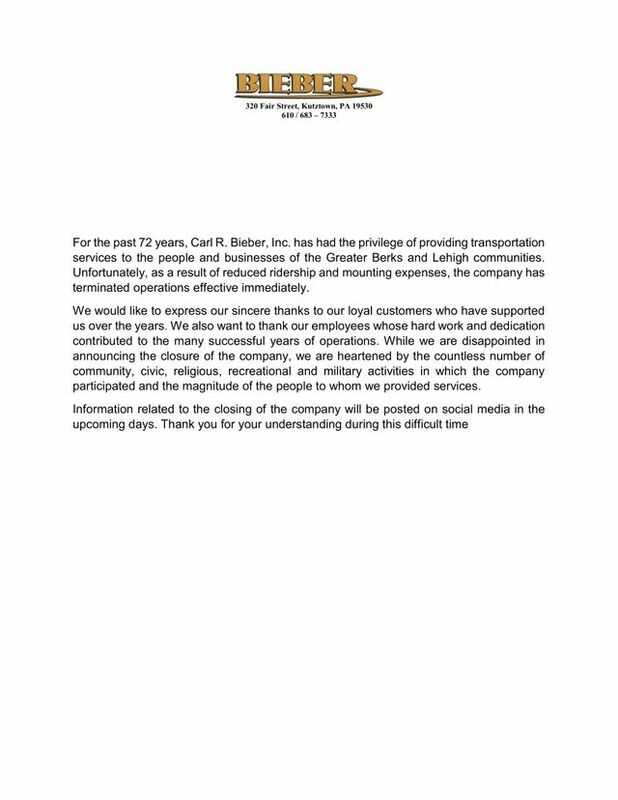 Bieber bus has permanently discontinued operations. There will be posts on social media in the upcoming days.